A jiu-jitsu black belt with knockout power, Poland’s Tomasz Narkun is a force to be reckoned with. All but one of his career victories have come by way of finish, and you can guarantee he’ll be looking to put Phil De Fries away before the final bell. On the feet, the Pole is a dynamic striker. However, I feel he’s a much better kicker than boxer. His front and low kicks are excellent weapons at distance, and they were on full display in his back-to-back light heavyweight title fights with Mamed Khalidov. I don’t think Narkun is a defensive wizard, especially on the inside. While he can be taken down, he doesn’t usually mind as he has a legitimate ground game. Specifically, Narkun is deadly off his back and this was a significant factor in both victories over Khalidov. Narkun’s guard game versus the top control of De Fries may be the most intriguing aspect of this match-up. It’s worth noting that Narkun is a career light heavyweight, weighing in at 202 pounds for his last fight. He’s moving up to heavyweight for this contest and will be the much smaller man. I know I’m not the only one guilty of underestimating Sunderland’s Phil De Fries in the past. I thought 6’7 savage, Michał Andryszak, would have his way with the Englishman – but that wasn’t the case at all. De Fries showed grit in weathering the early storm before dragging the Polish fighter to the mat and smashing him. In his subsequent fight with Karol Bedorf, De Fries once again proved the oddsmakers wrong – landing takedowns and submitting the former champion on the mat. Although De Fries didn’t shine in the UFC, he may finally be reaching his full potential in KSW at 32-years-of-age. While never known for his striking, if you watch his last few fights I believe he’s improved this area of his game. De Fries seems to favor a boxing attack and isn’t much of a kicker, which means he’ll need to work his way on the inside (and quickly, since Narkun will cause damage if you hang around at distance). To be honest, De Fries probably isn’t going to want to strike for long – as his key strengths are his wrestling and top game. As the much larger man and superior wrestler, I believe he’ll be able to get takedowns – but the big question is what will happen on the mat? A crafty guard player, Narkun will be comfortable fighting off his back – as it’s worked for him in the past. The problem is De Fries is heavy from top position and I just can’t see him getting swept or caught in a triangle. In modern MMA, I’ll always favor the guy with a solid top game versus a good guard player. In this interview with James Lynch, De Fries mentions spending a large portion of this camp at American Top Team where he’s been working with some of the best heavyweights in the world. Rolling with Alexey Oleinik must be great for preparing for this style of opponent. I’m betting on the man from Sunderland – I think his wrestling, top game and physicality will be too much for the skillful but undersized Tomasz Narkun. 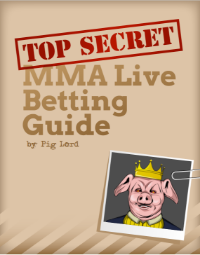 Sign up at any of the above links and get my Top Secret Live Betting Guide.